I recently blogged about the British habit of relying upon tinned food rather than creating a meal from fresh ingredients. (See 'Can't Cook, Won't Cook' on 16 September 2015). 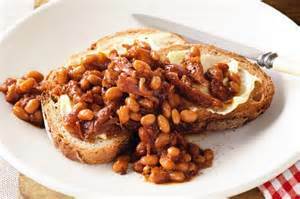 Baked beans were one of the top tins that the average Brit relies upon. 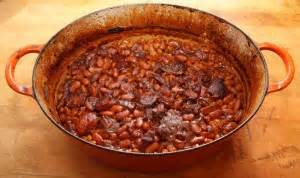 Why not make your own baked beans? Homemade beans are a revelation. When you have tried them once, you'll realize it's definitely worth taking the time to cook your own rather than simply opening a can of ready-made beans. Heat the oil in a large saucepan, add the onion and fry over a low heat for 5 minutes, or until softened. Add the celery and garlic and fry for another 1-2 minutes. Add the tomatoes, stock and soy sauce, then turn up the heat until it boils. Turn down the heat so it is simmering, and cook for about 15 minutes, or until the sauce begins to thicken. Add the sugar, mustard and beans and cook for another 5 minutes, or until the beans are heated through. Meanwhile, toast the bread lightly on both sides and butter if you wish. Stir in the parsley to the bean mix and then spoon on to the toast and start eating.